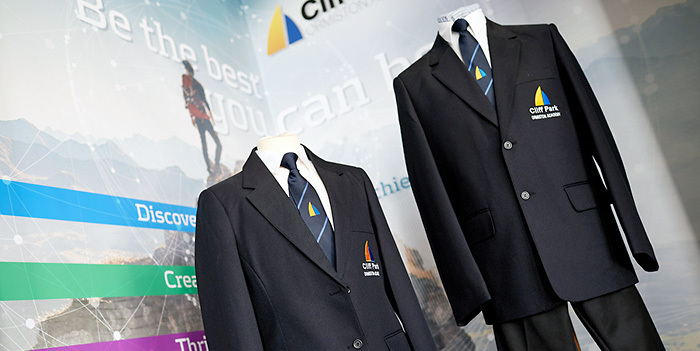 At Cliff Park Ormiston Academy we like our students to be smartly dressed at all times. It is the responsibility of all members of the academy community, staff, students and parents/carers to work together to help ensure the policy is adhered to. BLAZER – should be plain black, uniform style with academy badge on breast pocket. Sleeves must not be rolled up. BLACK TROUSERS – should be uniform style and not have pockets along the length of the leg. They should be worn around the waist. No jeans, jean-like styling or cords. No skinny style trousers, leggings or canvas trousers. BLACK SKIRT – should be uniform style (only available from Harrisons) and an appropriate length, no shorter than top of knee. WHITE SHIRT – should be uniform style with a stiff collar and buttoned to the top. Long sleeved garments should not be worn under uniform. Shirts must be tucked in all the way round at all times. ACADEMY (COMMUNITY) TIE – should be “clip-on”. It should not be covered by a scarf. JUMPER – Plain black V-neck jumper, uniform style (only available from Harrisons) with academy badge on breast. Optional item to be worn with blazer not in place of. Cardigans are not permitted. FOOTWEAR – should be plain black including black soles made of leather or leather imitation. No logos, no boots, no plimsolls and no trainers or trainer-style shoes. Shoe laces should be black. TIGHTS / SOCKS – should be plain black or white. Socks should be below the knee in length when wearing a skirt. OUTDOOR COAT – should be plain with no logos. No “hoodies” should be worn with the academy uniform at any time and will be confiscated. JEWELLERY – Allowed: a watch / one pair small stud matching earrings or small sleepers – one per ear lobe. Any other visible facial/body piercings (including tongue) are not allowed and will be confiscated. No other jewellery is permitted, except a discreet religious symbol. MAKE UP– only discreet/natural make up and nail varnish is allowed. The academy reserves the right to ask students to remove any makeup and nail polish at their discretion. HAIR – no extreme hairstyles or hair colour (e.g. No1s, tramlines, dip-dyed/ombre, denim or unnatural colours such as blue, purple, pink etc.). HEADWEAR – religious headscarves must be plain black. Other headwear (such as baseball caps, scarves and beanies) are not permitted within the academy building. PE POLO SHIRT – with academy logo. PLAIN NAVY TRACKSUIT BOTTOMS – with academy logo. They are allowed to be worn during the colder weather at the discretion of the teacher. WHITE SOCKS / PE RUGBY SOCKS. PE FLEECE – with academy logo. SPORTS TRAINERS – with non- marking soles. For reasons of health and safety, pumps and/or plimsolls are not suitable.